on Hitler's orders by Otto Scorzeny, an SS thug and daredevil saboteur. the cover name Amir from the resident in 1940.
stations were working under tremendous strain. The "light cavalry"
received orders to prevent the assassination attempt at all costs. British intelligences moved ruthlessly to detain all the suspects. temporary arrest on the slightest suspicion. repeated the answers in Russian. Operation Long Jump. The Germans established communication with Berlin. Embassy, where he was provided with security guards. But the U.S.
precautions had been taken to guard the Prime Minister. Churchill on his birthday, November 30. But these plans were foiled. "You must have had a certain amount of luck," noted Ms. Sandys. professions, and all the more so for that of an intelligence agent." necessarily represent those of RIA Novosti. I have always said that russians are smart and intelligent, everyone always underestimates Russia!!! Good point. But let's not forget Gevork Vartanian was Armenian. I forgot to add at the end, thanks to Armenians!!! Is "soviet intelligence" similar to that best of oxymorons- "military intelligence"? Interesting post. On behalf of the allies, thanks again to the Russian Soviet intelligent agent. In addition, those who speak Russian, I will recommend a great movie about this plot. Tegeran 43 is a cool movie with Allen Delon and Natalia Belokhvostiva with partial appearance in the movie of famous Armenian illusionist Akop Akopian. Great movie. Check your local Russian-Armenian video store or the net. Gevorg and Gohar Vardanyan, two young Armenians, were recruited to help foil the Adolph Hitler’s plot against the three world leaders when they met in Tehran in 1943; their names were revealed in declassified information in 2000, and the Russian couple came to Yerevan last week, ArmeniaNow reports. The “Long Jump” operation designed and elaborated by the German command was to have translated Hitler’s plan into action. Abwehr and SD were concerned only with one circumstance – the activities of the head of Soviet fixed-post spies in Iran Ivan Aghayants. Gevorg Vardanyan says he was 16 when on February 4, 1940 he voluntarily established direct contact with Tehran’s resident intelligence agents, Aghayants in particular. Still in August 1941, Aghayants was sent to Iran as a fixed-post spy to ensure strategic supplies. It was here that Aghayants crossed paths with a wide network of agents created by Germany that controlled German intelligence in the USSR. It was at that time that Hitler’s choice of the liquidator of the Troika fell on Otto Skorzeny. Aghayants had totally irreplaceable support – Vardanyan's group moving around Teheran on bicycles would trace six German wireless operators. The group traced the saboteurs and arrested them, according to Vardanyan. The bearings on the work of the radio stations were taken and their reports to Berlin were deciphered. As a result the German command would have to give up its designs to redeploy the main implementers of the ‘Long Jump’ operation to Tehran. The Vardanyans who were invited to Yerevan by the Development Fund of the Caucasus Democracy Institute, say that materials declassified six years ago are only the “tip of the iceberg”, writes ArmeniaNow. When, in 1943, Adolph Hitler schemed to assassinate Theodore Roosevelt, Josef Stalin and Winston Churchill while the three world leaders met in Tehran, two young Armenians were recruited to help foil the plot. The names of Gevorg and Gohar Vardanyan were revealed in declassified information in 2000, and the Russian couple came to Yerevan last week, where they told their story. By the fall of 1943, one of the means of achieving victory was, in his opinion, liquidation of Stalin; the Kursk battle had completely changed the course of World War II. The “Long Jump” operation designed and elaborated by the German command was to have translated this plan into action. And Wilhelm Canaris’s Abwehr and Walther Schellenberg’s political intelligence (SD) were concerned only with one circumstance – the activities of the head of Soviet fixed-post spies in Iran Ivan Aghayants. The Vardanyans who were invited to Yerevan by the Development Fund of the Caucasus Democracy Institute, say that materials declassified six years ago are only the “tip of the iceberg”. “If the half-a-century chronology of our activities is reflected on the face of a 24-hour clock, only the first two hours have so far been subjected to publication through publicist works or cinematography,” the Vardanyans told ArmeniaNow. Hitler, indeed, counted on the “Iranian Card”: he was well aware that the course of the war could be broken, also by physically destroying the heads of the USSR, the United States and Great Britain. The Nazi leader realized well the scale of the paralysis that would destroy the “Russian backbone” after the elimination of Joseph Stalin. By the fall of 1943, he was a little less concerned about the fates of Roosevelt and Churchill. Nevertheless, he could not miss the opportunity to kill all three “whales” of alternative policies with one shot, especially that they’d chosen Tehran as a venue for their meeting on November 28. Still in August 1941, Ivan Aghayants was sent to Iran as a fixed-post spy to ensure strategic supplies – armaments, ammunition, foodstuffs, medicines, raw materials and fuel to the Soviet Union; railway communications and unfreezing sea-ports of Iran objectively promoted the development of this plan. It was here that Aghayants crossed paths with a wide network of agents created by Germany that controlled German intelligence in the USSR. They were implementing spying, sabotage and undermining activities to disorganize the country’s southern borders and even periodically dispatched “visitors” to the Caucasus. Already in August 1943, Aghayants would thwart the implementation of the “Franz” operation devised at Schellenberg’s office – staging a spontaneous uprising of Iranian tribes along the “railway perimeter” of supply of American and British cargoes to the USSR. The twenty SS officers immediately working with tribe leaders and especially SD and Abwehr were greatly shocked when the leaders of the “controlled teips” who had accepted expensive gifts suddenly resold them at a profit and vanished into thin air. On the threshold of the Teheran conference it was Aghayants who gave headache to Canaris and Schellenberg most of all. Ivan Aghayants was well aware of the Fuhrer’s favorite spy’s capabilities. It was Skorzeny who had rescued Italian dictator Benito Mussolini in September 1943 and brought him to Hitler; the operation on Duche’s abduction from guerrilla captivity cost the lives of 31 paratroopers and the loss of 12 gliders. However, the Soviet fixed-post spy had totally irreplaceable support – the so-called “light cavalry” of Gevorg Vardanyan – a group moving around Teheran on bicycles would trace six German wireless operators. Hitler would have another fit of hysteria – his “Iranian Card”, on which he pinned a concrete and great hope, proved out-trumped – through the help of two teenage Armenians. February 17 marks the birth anniversary of Gevork Vartanian, a renowned Soviet intelligence agent, who helped thwart a Nazi plot to kill Allied leaders during World War II. Gevork Varta nian was born on 17 February 1924 in the south Russian city of Rostov-on-Don, into Armenian parents. In 1930, his family moved to Tehran. Vartanian was the son of an Iranian-Armenian Soviet intelligence agent who operated in Tehran for over two decades under the guise of a successful merchant. The young Vartanian’s spy career started early, when in 1940, at the age of 16, he received his first assignment and the codename Amir, The Armenia Weekly reported. His wife, Gohar, was also a spy recruited by Vartanian. She worked alongside him for three decades. His work in intelligence continued until the early 90s. The Russian Foreign Intelligence Service revealed Vartanian’s identity only in 2000. In the fall of 1943, at the age of 19, Vartanian prevented the Nazis from carrying out Operation Long Jump in Tehran. Approved by Hitler, and headed by Ernst Kaltenbrunner, the plot aimed to assassinate Stalin, Roosevelt, and Churchill. Soviet intelligence agent Nikolai Kuznetsov first uncovered the plan when he posed as an army officer from Nazi-occupied Ukraine, and extracted information from German SS Hans Ulrich von Ortel, known for his drinking. Vartanian and his group of like-minded youth – all around his age – were known as the “light cavalry.” They were known to travel quick, and light, often on their bicycles. Aside from Vartanian, the group was comprised of five Armenians, an Assyrian, and a Lezghin. Their task was to conduct surveillance work on Germans and possible Iranian agents. They were responsible for the arrests of around 400 Nazi agents. On the eve of the Tehran Conference, Vartanian’s team located a group of six German radio operators who had parachuted in near the city of Qum, 40 miles south of Tehran. The “Light Cavalry” followed the Germans to Tehran, where they were in contact with the local German spy network, and maintained contact with Berlin. Vartanian and his team continued to monitor their communications, and it was revealed that the Germans were planning on sending in another group of operatives to carry out the assassination plot. The members of the first group of German operatives were arrested. According to Vartanian, they then allowed one of the German radio operators to contact Berlin with news of the foiled plan. The Germans decided against sending the second group in, and called off the operation. In 1955, Vartanian graduated from the Institute of Foreign Languages in Yerevan. He was reportedly fluent in eight languages. In 2003, Yuri Lvovich Kuznets published a book titled Tehran-43 or Operation Long Jump. The book drew from declassified documents and highlighted Vartanian’s part in the events. In 1981, the Soviet-French film “Tehran 43” was released, and featured French actor Alain Delon. However, much of Vartanian’s career remains a mystery, as most of his work remains classified. Vartanian received the Gold Star medal of the “Hero of the Soviet Union” in 1984 for his intelligence work during World War II and the Cold War. He received three decorations after his 1943 success: the orders of the Great Patriotic War, the Battle Red Banner, and the Red Star. He was awarded the Order for Services to the Fatherland when he turned 80. 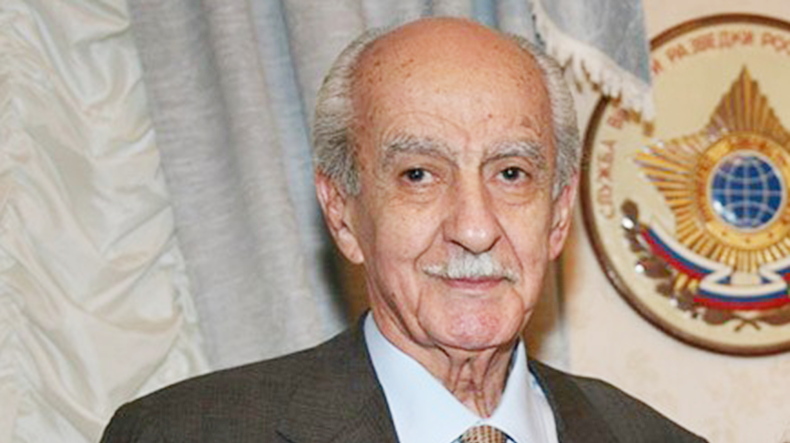 Gevork Vartanian died aged 87 on 10 January 2012.